"The Trimble T7 Tablet is the next step in the evolution of our data collection portfolio," said Scott Crozier, general manager for Trimble's Civil Engineering and Construction Division. "The Trimble T7 Tablet is the next step in the evolution of our data collection portfolio," said Scott Crozier, general manager for Trimble's Civil Engineering and Construction Division. "Surveyors, supervisors and inspectors can complete tasks with less downtime, combining Trimble reliability with the flexibility to adapt to a variety of configurations and jobsite conditions." The Trimble T7 Tablet brings powerful processing to the field—a sunlight readable 7-inch touchscreen that supports pinch, tap and slide gestures and a digital keyboard. Users can interact with the T7 intuitively, easily zooming, panning and selecting items on the touchscreen. The Trimble T7 Tablet is rugged and built to withstand the wear-and-tear of daily construction work in various weather conditions, while remaining lightweight. It meets stringent MIL-STD-810G for drops, vibration, immersion and temperature extremes and with IP65 and IP68 ratings, is sealed against water and dust. The full-color, 7-inch screen uses a Gorilla Glass display that is scratch and impact resistant. Optional, user-interchangeable Trimble EMPOWER modules make the Trimble T7 Tablet a flexible solution for a variety of applications. The Trimble EMPOWER Platform is a modular expansion system that gives users the power to customize their mobile computing solution to their workflow. Optional modules such as barcode imager, a barcode imager/RFID combo and sub-meter GNSS, give users the confidence of knowing that that their investment is scalable for future needs. Contractors can enjoy faster ROI, more flexibility and less downtime by taking advantage of the ability to move radio modules between controllers. 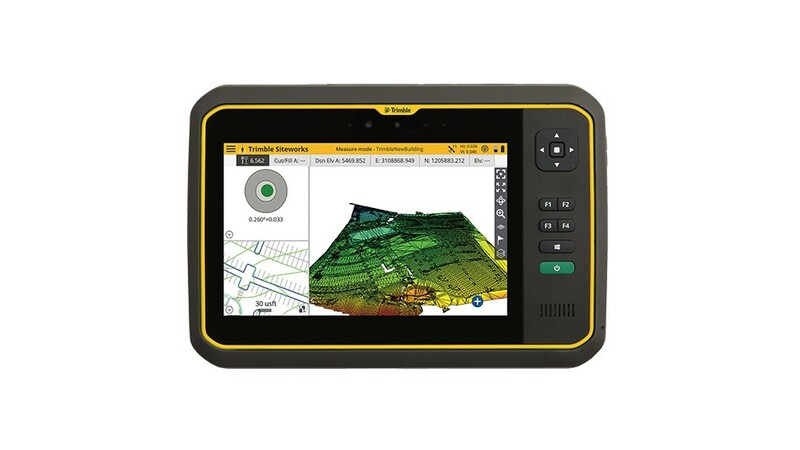 The Trimble T7 Tablet is optimized for use with Trimble Siteworks Software, survey software tailored for construction workflows. Siteworks Software features an interface that is optimized for ease-of-use and productivity. Configurable views, colorful graphics and natural interactions and gestures make Siteworks Software intuitive and easy to learn. The release of the T7 increases the available hardware configuration options for Siteworks users.